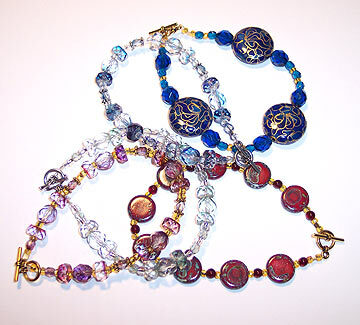 Beading Arts: Handmade beaded bracelets for the holidays! Handmade beaded bracelets for the holidays! It was past time to start making the smaller items that are always so popular at this time of the year. First stop..bracelets. I love making these. They're a terrific use of those beads that are left over from other projects. They're quick. You can add a couple of pricier beads without the cost rising out of control. So, my advice? Make bracelets for the holidays this year. Or take a look at mine! Thank you Amy! Hey, your computer's working again...yay!! A couple of fun blogs! Where is a (Bead) Doctor when you need one?